I have to say that I was pretty excited when I saw that one of our readers was interested in more posts about tinctures and herbs. Thanks Kristen! As most of you who read regularly know, I love to talk about herbs, and I just completed my first tincture and found it to be amazingly simple. What is a tincture (you may be asking)? A tincture is a preserved plant extract produced by soaking a given amount of plant material (usually in a dried or powdered form) in direct proportion to an extracting solution (usually alcohol) called the menstruum. Tinctures are also called dilute Fluid Extracts. Your next question might be why would I make a tincture? Why not just make a tea or consume the herb whole? There are a couple of reasons. First, tinctures are very concentrated so a tablespoon of tincture can deliver more herb than several cups of tea. Another reason is that tinctures are usually good for up to 12 months while teas and decoctions lose their potency after about 6 hours. My husband recently had some trouble sleeping and he is not a tea drinker. Having him take a small amount of a tincture made more sense than trying to get him to drink several cups of tea. Additionally, some herbs just don't taste great and a small amount is better than drinking several cups. Lastly, some herbal compounds can only be extracted by creating a tincture. For a standard tincture the ratio of plant material to menstruum (alcohol) is 1.5 ounces of plant material for 1 pint of menstruum. 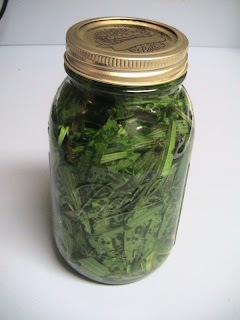 There are two techniques to making a tincture. I am going to teach you the maceration technique as I believe it will be easier for beginners. You can also use a percolation technique, but this involves a little more equipment. Mix about 1.5 ounces of plant material to menstruum (alcohol). Make sure that the plant material is either powdered or dried and in small pieces. You can use a blender to grind the herbs into smaller pieces or into a fine powder. For the menstruum you can use vodka, rum, brandy, vegetable glycerin, or apple cider vinegar. Alcohol is the preferred method as it releases the widest variety of essential herbal elements. Do not use rubbing alcohol, ispropyl alcohol, or wood alcohol. Mix the herb and menstruum in a glass jar. I just used a Ball canning jar. You want to make sure that it has a good sealing top so that the alcohol doesn't evaporate. Shake the bottle twice a day. Let the material soak for approximately 2 weeks at a temperature of 59-68 degrees Fahrenheit. Keep away from direct sunlight. Decant and filter the extract by pouring the herb and alcohol mix through several layers of cheesecloth or an unbleached coffee filter. When all the liquid has drained through, express the last bit by squeezing the herb filled cheesecloth or filter. Cork or rubber stopper the bottle and label it. Be sure to seal the container tightly with an adequate sealing lid. Store in a safe place away from small children. I would recommend storing in an amber bottle away from sunlight as well. The usual dosage of any tincture is a teaspoon 2-5 times daily. The tincture can be mixed in water or juice if the flavor of the tincture isn't agreeable. You can mix a variety of herbs to use in a tincture. For the tincture I prepared for my husband I used St. Johns Wort, Scullcap, and Mullein. So far he seems to be sleeping a little better. I'm excited to try more tinctures and will let you know as we discuss herbs which ones lend themselves to this technique. I encourage you to try this technique. It's amazingly easy and very satisfying to make your own tinctures.